Looking to get your bicycle repaired or service? The staff and volunteers at Back 2 Bikes have a wide range of cycling and engineering skills. 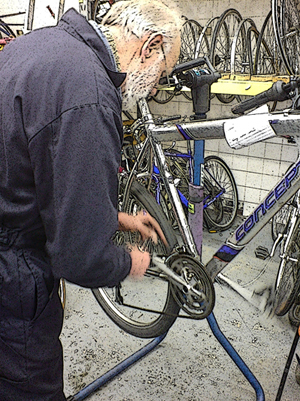 As such we are able to repair and service most types of bicycles including electric bikes. As a bicycle recycling centre we also have a massive stock of pre-used parts which can be used as an alternative to new parts if keeping costs to a minimum is important. Here's a sample of our guideline prices for common repairs, but please note they are subject to change. Please give us a call, or drop in to check the current rates.